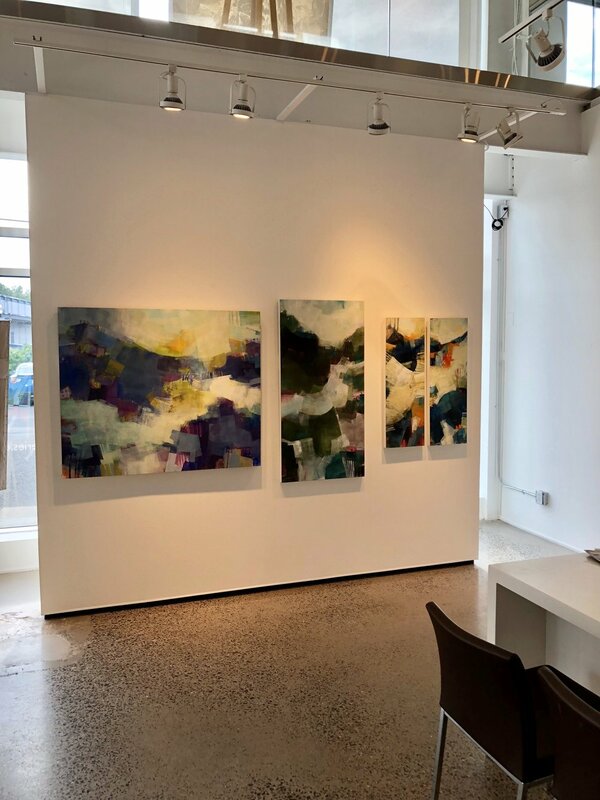 Excited to share that I began working with a new gallery. Butter Gallery in Collingwood. They have a second location called Mad and Noisy in Creemore Ontario. They recently shared some images of paintings in the gallery spaces with me and so I am sharing them with you. I’ve also recently sent some new paintings to Koyman’s and a picture of one grouping is also below. Don’t you love how they have displayed them? Not the most exciting artist topic at first glance. But I am pretty excited about gesso these days. Especially after realizing the wide range of gesso products and figuring out how to use them in a manner that enriches my paintings in a meaningful way. Gesso is a layer of paint that literally comes between the surface you are painting on and your painting technique of choice. While painting with oil or oil and wax it ensures that the painting can adhere to the surface and that compounds in the wood don't come through and distort the painted surface. Now that all the painting is done, I'm enjoying writing far more then the million things I should be doing to get ready. I am super excited and nervous about this show. This one feels very different from my usual. First of all, there are a lot of artists in this show, over 150. Many of them are artists who I have admired and secretly worshipped from afar. Okay, maybe not that secretly or that far... To be sharing my work at the same venue as them is an incredible honour. The other element that makes me both excited and nervous is the large amount of people traffic that typically attend this show. (I won't mention car traffic - because when I visited the show last year, on a glorious sunny day, I had no problems finding a parking spot... Just sayin'!) Getting to meet so many people is really exciting and a bit of a scary. Anyone who comes up and says hi, will have no clue (unless they are reading this) that I am anxious in these kinds of social situations. I love people and connecting with others once I am in the moment, but the days and hours before I wonder if I'll remember my own name or say something incredibly stupid. Oh wait, I made a sign with my own name, so it's just the saying something stupid part I need to worry about. Thank you vista print for an amazing banner! I may have neglected to mention that I've been creating some new works for the upcoming show. I am always influenced by the seasons, and come spring (well sorta Spring) I have begun working with brighter colours. Also been working on a series of 12x12 square paintings. You can see how messy my studio is these days. Household chores have become an all or nothing thing lately. Once I start cleaning I won't stop, and then I never get any painting done. So I have had to give up cleaning. : ( And I feel guilty (no joke) and uncomfortable about it. But I am realizing that when I share the mess, I don't feel quite as bad. So here I am embracing the mess and my bright green crocs. Absolutely embracing those too. I love love love this quote by Clarissa Pinkola Estes. I really enjoy my teaching gigs. After working in solitude in my studio, the opportunity to get out and meet other artists who are passionate about creating art is so enjoyable. When I'm working I have to stay so focused and it sometimes even feels selfish. So helping and sharing in the classroom creates an opportunity to remain balanced. My point is, that I teach because I really enjoy it and find it personally enriching. That the art school wants to support us teachers by sponsoring a show is a wonderful gift. I've posted a few of the paintings I have on display. On display at Prosserman JCC, in the visual art instructors art show. so are the paintings below. Have you ever heard that dogs know their human is coming home, well before they arrive? I have no concrete evidence to prove this is true, but I am pretty sure my Buddy perks up a few minutes before my DH gets home. Not wanting to compare myself to the greatness that is my dog, I do think I have that same feeling about Spring getting closer. Just the thought of Spring makes me happy, it’s been the coldest February since I was old enough to care. I’m not blessed with dog telepathy, but there are little clues that spring is near that I’m picking up on; morning sun, longer days, and well, I’m starting to think about flowers again. It’s been a bit of an artistic crisis, because I haven’t painted any flowers since October. I wondered if I was bored with flowers, or if I was just ready to explore new themes. 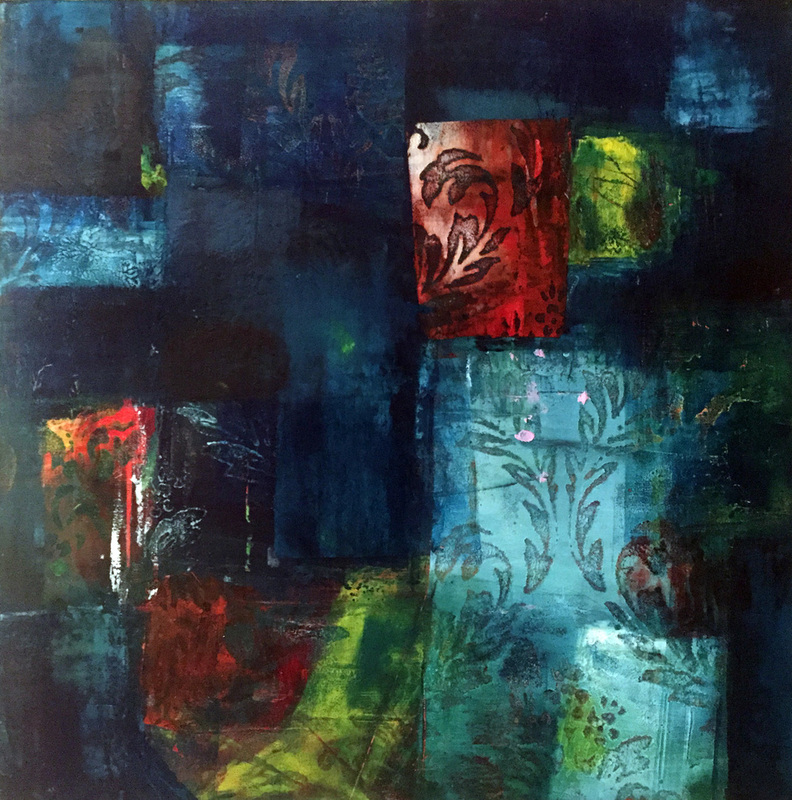 I didn't connect the dots this winter, as the theme I began exploring in my paintings was quilts, which I painted in deep dramatic colours I typically ignore. This got me thinking of Eastern Wisdom as well as the Traditional Chinese Medicine principle of “nourishing yang in spring and summer time, and nourishing yin in autumn and winter time”. Perhaps painting flowers in the winter is not in harmony with nature. They don’t nourish the yin, the way a warm cozy quilt might, which is better suited when the weather is so cold and dry. Another theory is that creation is about reflecting on what we see. Wintertime, has much beauty to offer, just consider the recent excitement over a frozen Niagara Falls, or the beauty of The Group of Sevens' paintings of Northern Canada. Winter is beautiful, albeit not floral.